From January 20 until June 1 2017 we will be upgrading our facilities with a renovation to make your future stays better. We are currently working on the guest rooms during the day time. Thank you for your patience with us as we grow Welcome to the DoubleTree by Hilton Hotel Atlanta Marietta located just off I-75 and I-285 in the northwest Atlanta suburb of Marietta GA. IBM Lockheed Martin GE Home Depot Manhattan Associates Graphic Packaging and Coca-Cola are just a short drive away. 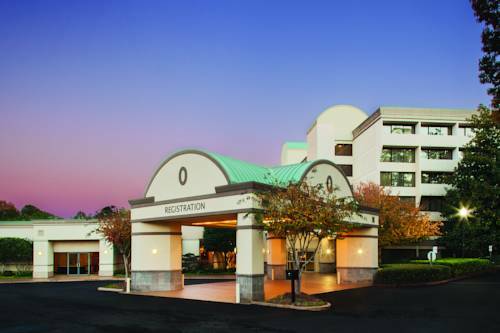 Our hotel in Marietta GA is 20 minutes from Hartsfield-Jackson Atlanta International Airport /ATL/ with easy highway access to restaurants shopping golf courses attractions and entertainment. Retreat to a contemporary and spacious guest room or suite featuring signature bedding work desk WiFi and a 42-inch HDTV offering over 30 HD channels. All guest rooms feature premium bath products. Relax in our warm and welcoming lobby. Indulge yourself with a variety of modern American cuisine as well as classics for breakfast lunch and dinner at our casually elegant restaurant the Mondo Mocha Cafe. We also offer an espresso/coffee bar as well as a full bar. Maintain your exercise regimen in our fitness center featuring modern cardio and strength training equipment or go swimming in the unique indoor and outdoor pools. Host your business meeting or special event for up to 500 guests. Our hotel offers 12 000 sq. ft. of flexible event venues including boardrooms and ballrooms. Our 24-hour business center provides complimentary WiFi two touch screen computers and other services. Explore Atlanta attractions such as the World of Coca-Cola the Georgia Aquarium the High Museum of Art and the Martin Luther King Center. The Mondo Mocha Espresso Bar serves espresso cappuccino lattes and a complete selection of daily baked goods from our in-house bakery. Enjoy the same great menu of the Mondo Mocha Cafe in the comfort of your hotel room.